My first night in Jeddah, I had a long walk along the Corniche just outside my hotel. I didn’t really want to stay out any longer because I was pretty tired and wanted to get up early the next day, so I popped into an Indian restaurant on the way back. I don’t know the name and can’t find it on a map, but its pretty hard to miss if you’re walking between the Hyatt and the Corniche park area. I got myself a veggie korma and some naan and headed back to the hotel. Important side note, the restaurants here don’t give you plastic eating utensils. They sort of assume that folks are just taking the food home to eat, I guess. So I had to improvise a spoon out of the foil, yay girl scout training! Also, good food. On my way back I’d spotted a BBQ restaurant and figured I’d try it another night. I think BBQ might be international code for “meat cooked over fire”. We have an assumption about BBQ in America that involves a sweet yet tart sauce, but this place seemed like it was trying to represent the BBQ of every nation on earth focusing on America, Brazil and the Mediterranean. I got the lamb chops with mint BBQ sauce and a side of grilled veggies. It was quite excellent. No room for desert, but I finished off the night with a turkish coffee, lightly spiced with cardamom. This might be my favorite restaurant in Jeddah (close to a tie with the Marina). The restaurant itself is built to mimic an outdoor garden cafe. Its divided by little stone walls, fountains and trellises, and the ceiling is inset and painted to look like a beautiful blue sky. It gives the illusion of sitting in a cool oasis while allowing one to escape the heat and humidity. The menu is varied, mostly Western style food with a few traditional dishes. There are breakfasts, salads, pizzas, pastas and entrees of meat and fish. I had the Shakshouka on my first visit. Its a poached egg dish with tomatoes and onions. As my culinarily inclined US roomie pointed out, it might be impossible to find an egg and tomato dish that I don’t like. Another meal I had a sort of chicken stir fry and a green mint tea. 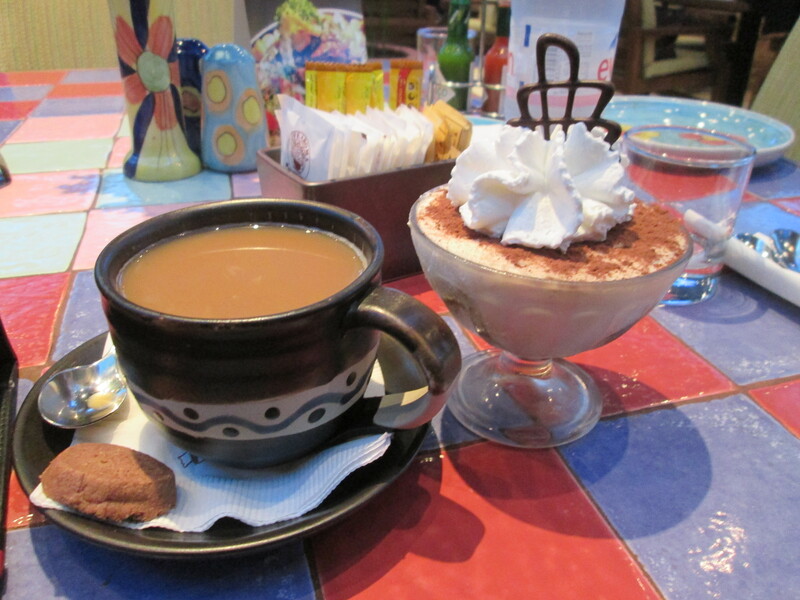 I also had some coffee and tiramisu for dessert. The tiramisu was actually served in a portion size that was slightly smaller than my coffee cup, which was refreshing because I’m so tired of American oversized but underflavored desserts. This one was a taste explosion in every bite, although I’m sure they had to use a non-alcoholic beverage to soak the ladyfingers. The staff are attentive and polite without being obsequious. The food is really good, plentiful and reasonably priced. Its possible to eat healthy there, which is not always easy here in the land of meat and starch. The atmosphere is soothing and you can spend a few hours lingering over a meal either while waiting for the sun to drop low enough to walk the Corniche, or unwinding and cooling down after a night exploring the town. This one is the close runner for favorite. Just a teeny walk south of the Park Hyatt (like half a block) there is a building set back a bit from the road. Apparently they use this for art exhibits and business expos, but if you walk through it, you reach the Marina and Yacht Club. There’s a lovely restaurant there where you can eat indoors or stay on the balcony overlooking the water and the people walking below. I had two separate people recommend this place to me when they heard my hotel was near the Hyatt, one among the group of South Africans I’d met on my first night on the Corniche, and the other a Palestinian lady I met at the beach. So I decided I should definitely check it out. In addition to the stunning view, there is a fabulous (if expensive) menu and a great shisha menu too. I got myself a veggie pizza and a lemon mint shisha. The food was good, but this wasn’t a surprise. The shisha is really what I want to talk about. In the US, any time I’ve had a hooka, its been with these pre-packaged, kind of dried out cubes of tobacco. Here the shisha is a goopy sticky mess of molasses, flavor and tobacco– fresh. The shisha was brought out in a large hooka pipe, and the waiter placed a new plastic disposable mouthpiece at the end of the hose and pipe handle. This was pretty cool because it allowed them to use these high quality hookas without having to worry about cross contamination. The shisha was delicious, and there were a fleet of coal bearing shisha attendants who circled around making sure we all had fresh coals, and blowing the ash out of the dishes to keep the shisha as fresh as possible. After a while I got myself an iced mocha. Most places seem to equate ‘iced’ with ‘blended’ and this was no different, but the quality of the chocolate and the coffee was much higher. They were having a promo on the shisha to buy one get one free, so I ended up staying until almost 2am watching the people walking on the waterfront below, reading my book, sipping my coffee and smoking shisha. Cost me around 55$ US for the diner, the coffee and the shisha and probably about 4 hours of relaxing evening. Additionally, I’m told they have a great brunch deal at 11am that includes a full breakfast and a shisha for something like 180 SAR, which is a pretty good deal. Right next to the Marina, and probably much more famous is the Park Hyatt. It seemed like a must do for the trip, so on my last night in Jeddah, I headed over to the Hyatt for diner and shisha. I compare this to the Marina because they are similarly located and offer similar services. The food at the Hyatt is downright gourmet awesome. I splurged on the salmon. Now, I’m a good cook, not a chef or anything, but I like my food to taste good, so I learned how. Most of the time a restaurant is just a place that makes food I could make, but don’t want to be bothered to. Every so often, however, there is a meal that makes you remember why it is culinary art. The last one of these for me was that little diner off the Oregon coast on my Thor’s Well camping trip. The Park Hyatt was another. Starting from the bread. Fresh and made on site if I’m any judge. It wasn’t right out of the oven, but was likely less than an hour old. There was a light dusting of flour from the baking process and a light taste of sourdough that made me believe the dough had been well rested and even slightly fermented before baking. It was hard to resist filling up on the bread alone while waiting for my meal. I’m picky about salmon. The Red Sea is famous for its seafood, so I decided the chefs here should have a clue. 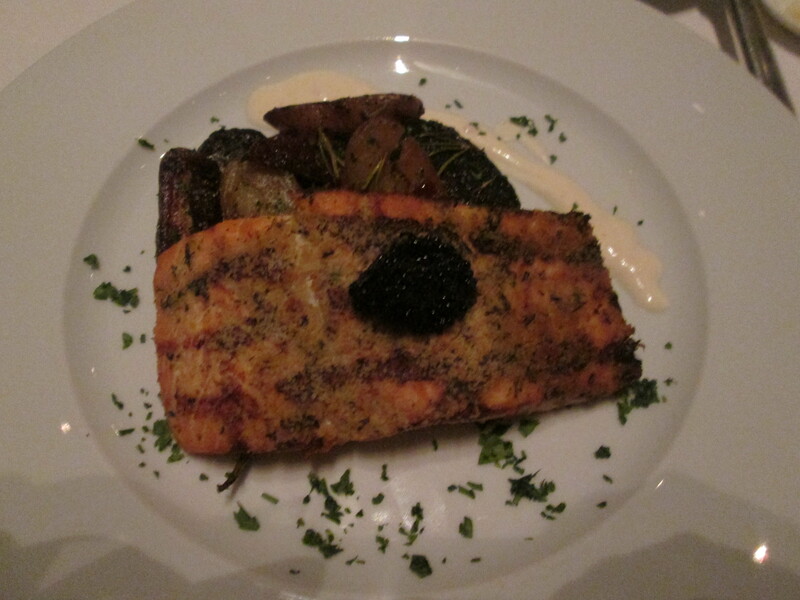 They managed to serve me a slice of salmon filet that was still moist even on the thin edges. The fish was so lightly breaded it was just a thin crust of crumbs and herbs that gave a light contrast to the texture and flavor of the fish without overwhelming it. The potatoes were tiny fingerlings sliced in half and pan fried with rosemary and sundried tomatoes. Accents included a small scoop of caviar and a kind of white cream sauce. I alternated combinations to see how the flavors blended. Not a meal you want to talk or read through, because it might distract some of your attention away from your taste buds. I did not have room for desert, but I stepped out onto the terrace for coffee and shisha. The Park Hyatt has the best view of the King Fahad fountain around. The outdoor seating area is right on the water and includes a small decorative pool, a couch lounging area, and a dining table area. There are outdoor air conditioners to keep the dining area cooler and drier than the surrounding areas. In this respect, it outdoes the Marina with an even more stunning view and a cooler environment that is not dependent on the sea breeze. However, I think I’d still go back to the Marina if shisha and coffee was my goal. The coffee at the Hyatt was quite nice, but not quite as good, and I think they may be the only place other than Starbucks that actually served coffee over ice instead of blended. However, the shisha menu was much more limited in flavors, only about 1/4 the options as the Marina. Also, when the hooka was brought out they used a disposable hose, rather than just a mouthpiece, which meant that the hose and handle were all plastic. Maybe that’s more hygenic? I’m not entirely sure, but I can say that the feel of the full weight hose and handle are much more appealing than the plastic. All told, the Hyatt is a great place for a delicious meal with a great view, a decadent indulgence. I passed a little sushi place on my way back from the Corniche on my first night and decided I really needed to have Sushi in Jeddah. So, Tuesday afternoon [redacted] and [redacted] came to take me to dinner and we went to Sushi Yoshi. Turns out this is a small chain, so we didn’t go to the one by my hotel, but rather one up on the north end of the Corniche that overlooked the sea. The family section was on the second floor, so we actually had a really great view. I wasn’t sure what to expect from a chain sushi joint in Saudi, even in a coastal city, but it turned out to be quite delicious. I’d say mid-range price, reasonable for the quality and quantity of food. I’m a little spoiled by our conveyor belt sushi in Seattle, but really, 30-35$ per person for a large sushi dinner is pretty good. Also, I don’t think I could ever get tired of eating dinner on the ocean front. Ever. I’ll talk more about the beach itself in another post, but La Plage beach had a restaurant as well. The prices are about what you’d expect from a nice restaurant, possibly a little on the low side for a private resort, on par with Aroma and less expensive than Hyatt. I chose the Oriental (by which they meant Middle Eastern) breakfast and logged into the wifi. A delicious meal of sliced tomatoes, some kind of pickled vegetable, fresh cheese, labneh – this creamy yogurt stuff that’s like a halfway point between cream cheese and sour cream, some beans in a tart sauce, mint leaves, olives and pita. Everything came in separate little dishes so I could mix and match. Who knew mint and tomato were such a great combo? I made a little wrap with the cheese, tomatoes and mint and it was so yum! The rich cream was a nice compliment to the tart beans, and the olives and pickled veggies were little refreshing bites in between. I admit, with the whole day before me, I lingered a long time over this meal, chatting to folks online and savoring the flavors and the view. Later in the day I came in for some snacks and an iced (blended) coffee. I’m pretty sure they put frozen whipped cream on my coffee. Ridiculously good. On the weekend, apparently they also have a sushi menu, but it was really expensive, and I’d already had my sushi fix for the week, so I stuck to the regular menu. I think if I lived in Jeddah I’d have to find a way to learn to sleep after work so I could go out late at night to enjoy the Marina, and I’d never save any money from going to La Plage every weekend. I might also gain 30 lbs even if I did go for a walk on the Corniche every night. *Sigh, but it was nice while it lasted.